On the road to Angelus Oaks, it is a long 6+ mile climb up to Forest Falls where the road makes a sharp 90 degree turn then goes up and up for another 5+ miles to Angelus Oaks. Things really heated up as I left the Ranger Station. Time for GU's. 1 GU every 30 minutes. I was feeling good. Feeling outstanding and getting better all the time. There must be a GU in here somewhere! 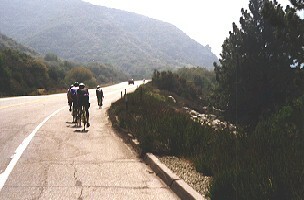 A couple of miles up the road, I started to have another "major sweat attack". I was Breathless. Pain. Agony. Torture. More sweat. This is not a good thing. I felt horrific -- like a nuclear meltdown. Can't see my instrument panel. 20 minutes later and still pouring down -- what's wrong with this picture? 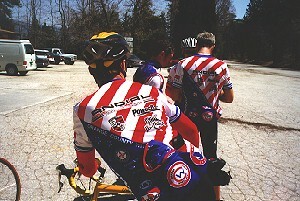 I've done hard rides before but I was giving it everything I had today. Couldn't see much of anything. It only got better once I got up to a high enough altitude for some cool mountain fresh air to blast me. What a relief!! Photo courtesy of Lynne Billie Irwin. Time for a new song. My all time favorite, "One Way Out" by the Allman Brothers Band. I was hearing Dickey Betts and Duane Allman playing competing guitar riffs from each side of the road. As the volume increased, my speed picked up. At the Forest Falls turn, I saw Marty heading down. 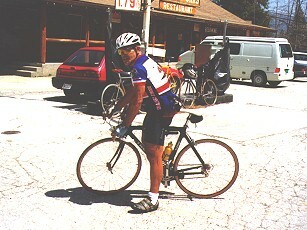 He said he needed to cut it short today but looked like he was in cycling heaven as he flew down the road. I was looking forward to some great downhills also … but that would have to wait: I still had another 4,000 Feet of Climbing ahead of me today. 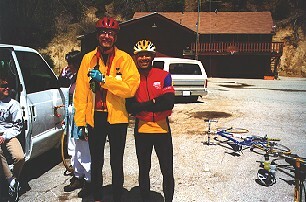 As I was about half way up from Forest Falls to Angelus Oaks, Walter Myers caught up with me. 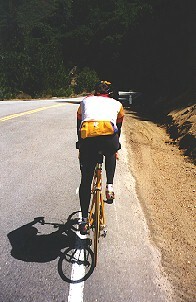 It was good fun riding with Walter on his new Gold Trek Carbon Fiber bike. It was beautiful to watch Walter ride it up the mountain. Walter has had some major knee problems this year -- but not on this day: he was riding very well indeed. It was really a great thing to see. Walter and I kept on guessing where Angelus Oaks was. Just around the bend. Oh, the next bend. Gee, it's gotta be up here somewhere!! It was beautiful as we climbed up to Angelus Oaks. Good fresh Mountain Air. Waterfalls on the right. Lots of very green trees and major rocks. I thought, "This is really good scenery." At Angelus Oaks, I heard that Joe Mastro had another mechanical problem: he pulled a spoke after Oak Glen. Adam from the bike shop was driving the course and providing mechanical support but I don't think he got to Joe in time to help him out. 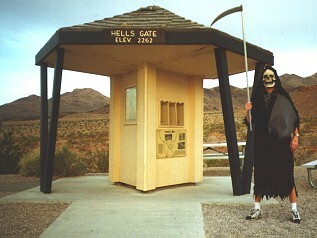 The Angelus Oaks Rest Stop was pretty popular as Walter and I arrived. Cherie Bystrom was running this Rest Stop for us and it was so great to be there with all of the Endorphins flowing. Ken picked up a cold a couple of days ago. It got worse by the time he made it to Angelus Oaks -- he was not feeling well and had cold shivers even with 3 layers of clothes on. A Power Bar and tons of Water brought him back to life. We kidded him later that he was resurrected on this ride. 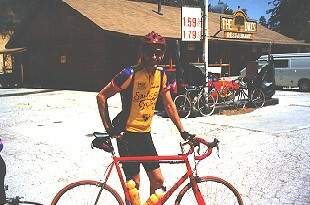 "The Old Ken" rode from the Start to Angelus Oaks. He was then upgraded to "The New Ken" from Angelus Oaks to Onyx!! Each of us had a major decision to make. Turn right and party all the way back to Sylvan Park, thereby completing 3 Passes with 6,830 Feet of Climbing in the first 46 miles!! 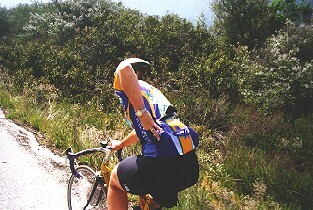 Or for those Brain Dead, turn left and climb up and up and up above the clouds to Onyx Summit. Congratulations to the 3 Pass Finishers below: Climbing 6,830 Feet in 46 Miles is awesome!! Only 5 minutes separated the Top 3 Women and only 10 minutes separated the Top 5 Men after all that climbing! !